US: The Sun has unleashed four potent solar flares this week, marking the most intense activity yet this year and causing limited interruptions to high-frequency radio communications. One of them was classified as an X3.2 flare, with X-class flares being the most intense type, the US space agency said. “This is the strongest X-class flare of 2013 so far, surpassing in strength the two X-class flares that occurred earlier in the 24-hour period,” NASA said of the flare that peaked at 0111 GMT Tuesday. A fourth X-class flare peaked at 0148 GMT on Wednesday, NASA said. Measuring at X1.2, it caused a temporary radio blackout that has since subsided, and was categorized as “strong,” or R3 on a scale of 1 to 5 on the National Oceanic and Atmospheric Administration’s space weather scales. The latest flares began on May 13 and have sent off bursts of radiation from the Sun, known as coronal mass ejections (CMEs). The strongest traveled particularly fast, at a speed of approximately 1,400 miles (2,253 kilometres) per second, NASA said. The CMEs have so far not been directed at the Earth but may impact satellites. NASA said the CMEs would produce a merged cloud of solar material that “may give a glancing blow to the STEREO-B and Epoxi spacecraft,” which are space-based observatories orbiting Earth to monitor solar storms and comets. “Their mission operators have been notified. If warranted, operators can put spacecraft into safe mode to protect the instruments from solar material,” the US space agency said. Experts say that a rise in solar activity is common right now because the Sun is in a phase of its 11-year activity cycle that is nearing the solar maximum, expected in 2013. 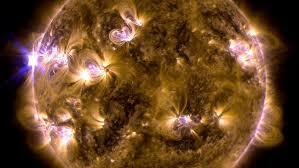 According to space weather experts at NOAA, more strong solar flares may be expected in the coming days. Although CMEs send off potent radiation, Earth is protected by its magnetic field.